Full Moon Releases Slew Of Remastered Flicks! Discussion in 'High Definition' started by Shawn Francis, Jun 28, 2012. PS. Got my trunk set today (along with a DVD copy of Shrunken Heads) and it's fantastic! ...with a $50.00 markup on an already overpriced set. satans-sadists and Katatonia like this. AVAILABLE TO ORDER THIS FRIDAY, 3/9! The first 300 units will be SIGNED AND NUMBERED by Full Moon founder Charles Band and will be exclusively available only at FullMoonDirect.com! Mining our own history with Charles Band's early 1980's Wizard VHS "Big Box" series of cult movie rental and sell-through releases, Full Moon is excited to announce the new VINTAGE VHS COLLECTION, a gorgeously packaged and presented series that features some of our most beloved titles on DVD and Blu-ray and houses them inside a beautifully designed, "Big Box" VHS case AND includes an exclusive Full Moon figurine in a collectible blister pack. The VINTAGE VHS COLLECTION is a LIMITED EDITION Series, with only 3000 units being produced of each title. 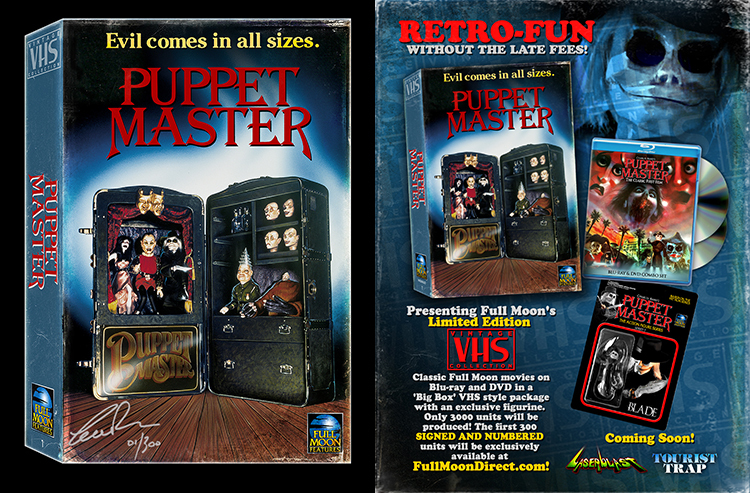 Our first VINTAGE VHS COLLECTION release is the immortal original 1989 chiller PUPPET MASTER (featuring a DVD, Blu-ray and figurine) and following that will be the 1978 Sci-Fi cult classic LASERBLAST and the horrifying 1979 masterpiece TOURIST TRAP. Free shipping and this month Sorority Babes in the Slimeball Bowl-O-Rama is the free DVD they throw in. Laserblast and Tourist Trap will be next. I wonder what those gimmick gifts would be as FM don't currently have any knick knacks for sale (I know, I find that hard to believe myself!). Original temp work said this would a new master and be uncut. This current press release and the listing on DiabolikDVD do not. So odds are this will be the usual cut... and probably not from a new master. Rather odd. I don't know if Band has his reasons for using the edited cut or just that any usable elements are lost. Yeah, this will probably be the same disc(s). Though if by some surprise the discs turn out to be uncut, I'll buy it. Of course, we know the next time Tourist Trap gets a Blu-ray release, it will be uncut so now the question is; Will the MVD release be the one with the uncut version? Looks like High Test Girls (1980) originally called Sechs Schwedinnen von der Tankstelle. Stars Brigitte Lahaie so that's definitely something to see! I loved those movies as a kid, but I'm a little scared to revisit them now. Maybe they're best left the way I remember them? DVD News Flash reports that the Prehysteria sequels and Pet Shop will be available on Blu-ray this December according to Charles Band. "THE DAY TIME ENDED: REMASTERED will hit Full Moon Streaming on 04/03, with an Amazon premiere the following week. The Special Edition Blu-ray release will street near the end of April." wago70 and Katatonia like this. Now this is one that should benefit immensely. I just have it in an old Platinum Disc DVD set, which has the same transfer that FM used on their DVD release... and it's a rather terrible looking Pan & Scan transfer from an old video master. A restored widescreen version should be a revelation.